The teasphere is a brilliant place, populated by superb people. It is also populated by scumbags like me, who enjoy the generosity of teasamples from a teafriend while neglecting to write an article on the subject. 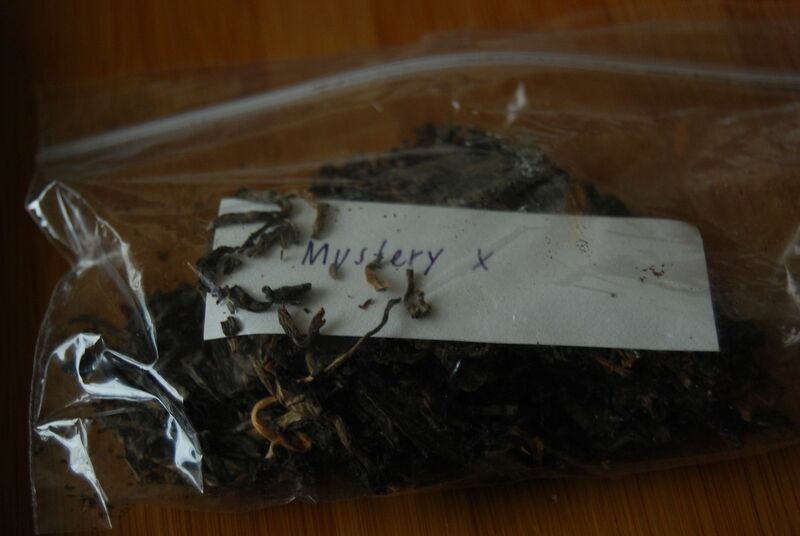 The mighty Hster sent me a trio of mystery samples last September, which I enjoyed no end; I don't get to drink anonymised teas these days, and so the opportunity to pick up the old habit was most welcome. In a spirit of craven prostration, I hereby offer this supplication of penitence to Ms. Hster. These samples were, as you will see from the photographs, anonymised as X, Y, and Z. Being a creative man, I drank them in that order. Their identities have since been revealed to me, which I will reproduce here for your amusement. Mystery X is actually the 2006 Douji Laobanzhang. 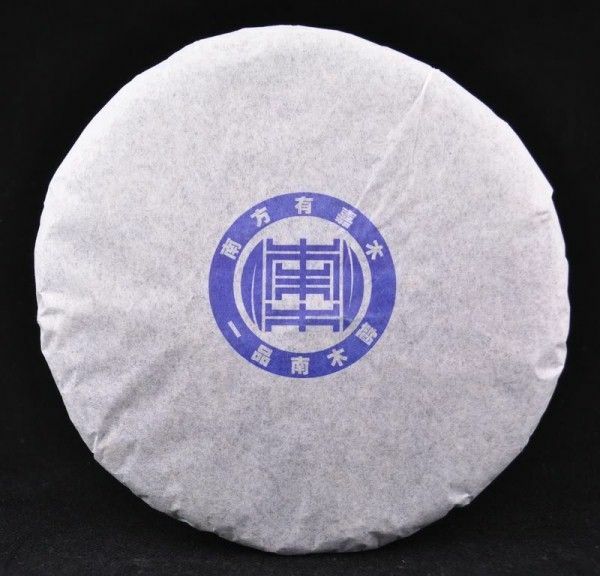 I don't recall seeing single-mountain versions of Douji teas back then, with the exception of the various cakes from which the company derives its name (Yiwu Zhengshan Tea Company). The leaves are medium-sized and I enjoyed their strong scent. Their brown shade suggested to me, at the time, that they were some 2-3 years old, which I thought to be supported by their still-fresh aroma. It actually turns out that they were 6 years old at the time of drinking, but the rather dry storage of Hster's (Berkeley, California?) home perhaps accounts for the difference. The soup is a yellow-orange, which is fairly uninformative with Douji cakes. 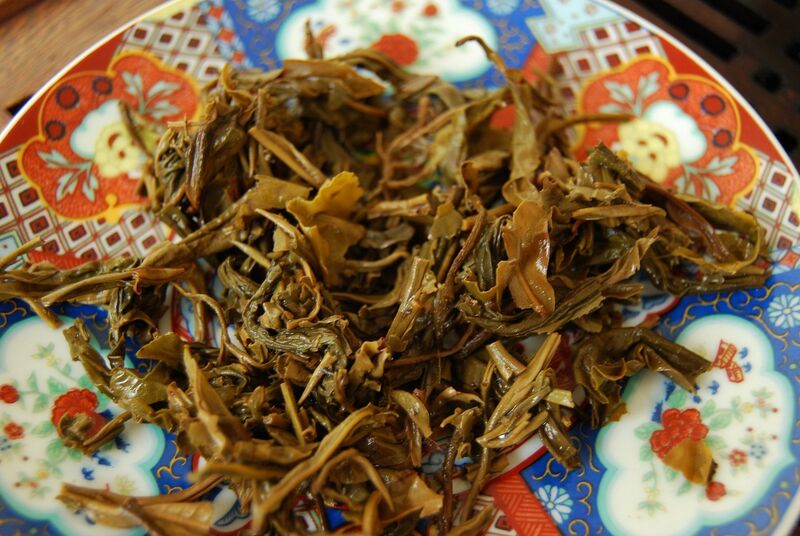 It has an excellent scent in the wenxiangbei [aroma cup], which is fresh, sweet, and long-lasting. The character is good, with a low tobacco and a solid base of sweetness. In the finish, I observed a "moderately dodgy Jingmai-style nuttiness - all molasses and darkness". This would not entirely be accounted for by the darkness of the Douji house style, which often becomes obvious in the throat and aftertaste. It is this nuttiness that completely threw me off the track, and I was rather surprised to learn that this was a "Laobanzhang" cake. It certainly has a character dissimilar to the later Douji "LBZ" cakes, even admitting their yearly variations in style. A curiousity. 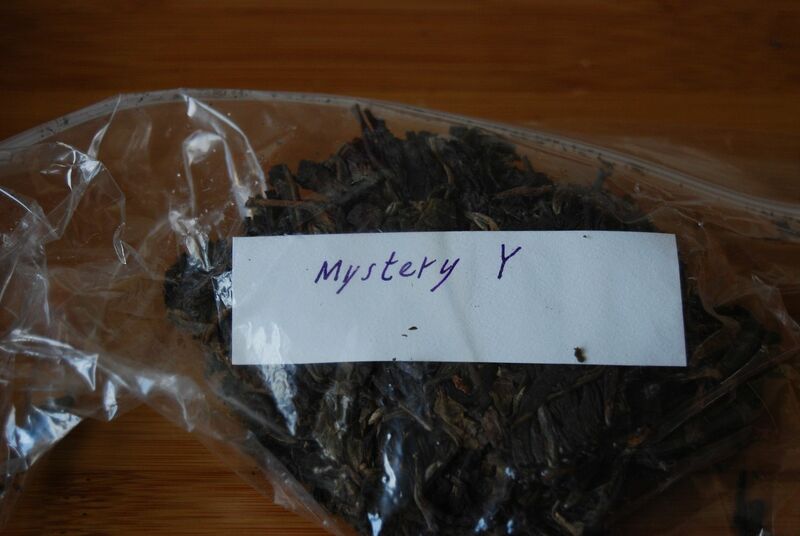 "Mystery Y" was actually the 2006 Douji "6FTM" blend, the precursor to the 2007 that I recently described. The latter was from China Chadao, and had been stored in relatively humid environs; this sample from Hster was intriguing for its Californian storage. Of course, all this was unknown at the time, which makes for a fun comparison. The darkness of the medium-sized leaves comes with a gently sweet scent that, I wrote, "can be no more than three years old". That it was twice this age came as another surprise. 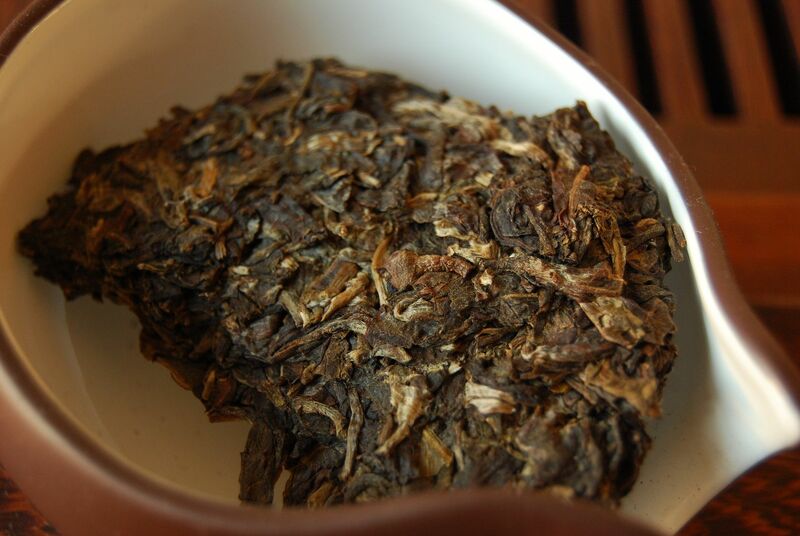 The inclusion of huangpian [yellow flakes, usually removed] in the sample suggests a rugged blend. 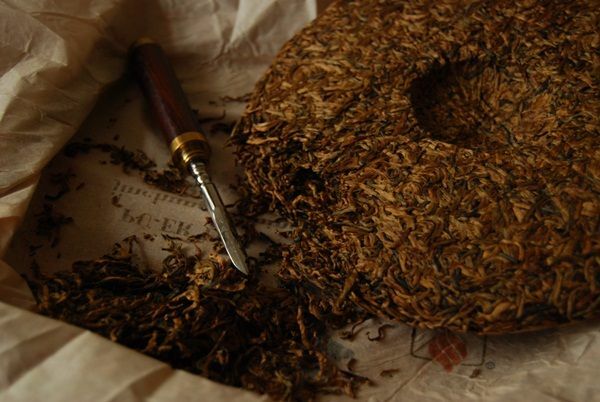 The body is reasonably energetic, and it has a decent base of old-fashioned tobacco. I wrote that this sample was "much more orthodox" [in comparison to the mystery X, a.k.a. 2006 LBZ], and this is probably accounted for by the fact that it is a broad 'Banna blend, making it one of a traditional class. This cake, however, was unimpressive in terms of its content: it was, I wrote, "inoffensive and sweet, but not forthright in character, and absent much of a kuwei" [good bitterness in the throat]. It was cooling on the tongue, as if from good leaves, and I recall that the 2007 version from China Chadao has this in common with it. 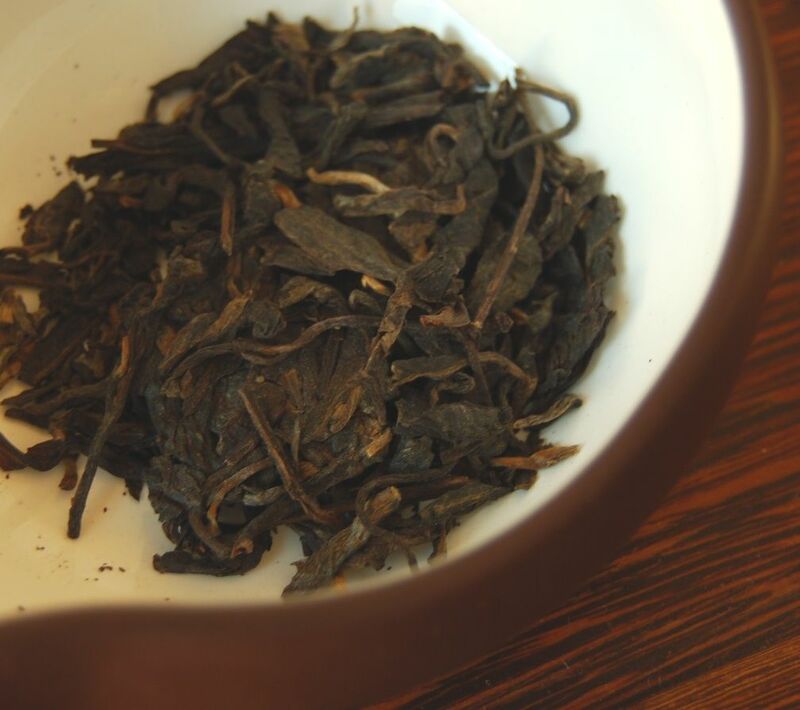 "The tea is constant and sweet, but not very exciting", I wrote - which almost matches verbatim my description of the 2007 version from China Chadao, oddly enough. At the time of trying Hster's Californian sample, I wrote that I had to "add more leaves to stave off its decline into basic sweetness". In light of the facts since revealed, and in comparison to the potency of the 2007 version stored in China, I wonder what could account for the difference in energy and strength between the two. Finally, "mystery Z" is not a Douji cake. It is the poetically-entitled "2008 GMS Economic Corridors Forum" cake, made by a friend of a co-worker of Hster. If you're thinking about a forum to do with corridors, the GMS Economic version is by far the superior. In comparison to the massive samples of the previous two cakes, this one was rather small in quantity, and I therefore immediately concluded that either there wasn't much of it in Hster's collection, or that it was rare, or both. 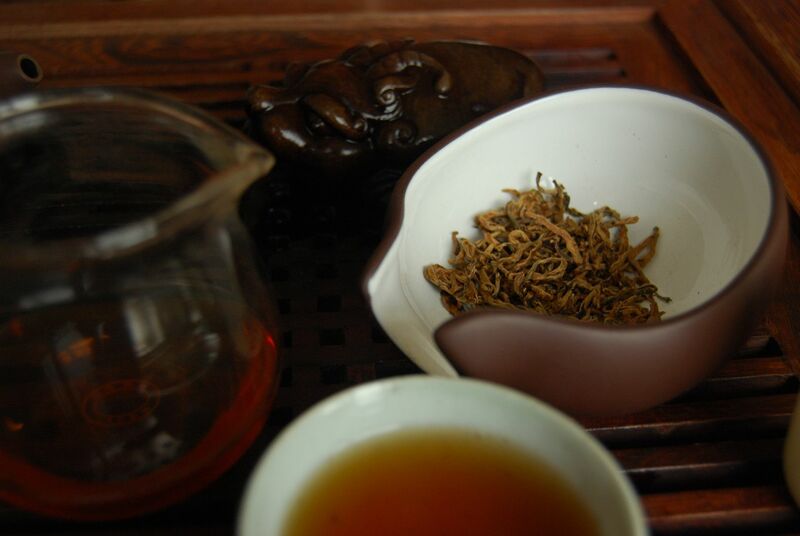 I noted that the maocha, pictured above, contains tons of stems and some huangpian, leaving me to conclude in my notes that it is "some kind of personal production". Woo! 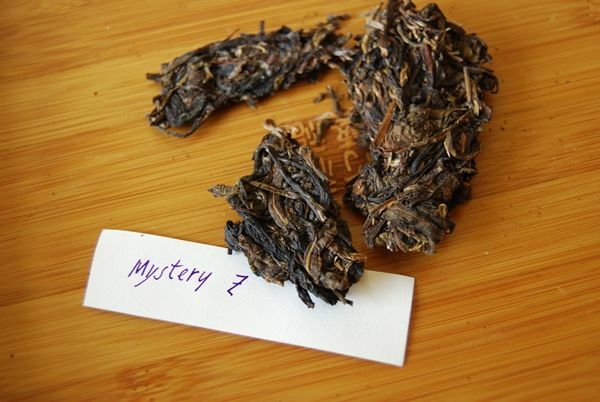 I also guessed that, as with the other samples, it was no more than three years old; its actual age of four years is therefore not immediately dissimilar, but it does taste rather young. Again, this could be due to the dry storage. "The scent is brittle and interesting", I wrote, "ending in smooth butter. The character is most unusual: it is dense and sweet, but has a slightly alarming edge. What is it? A tang that hints at something untoward." 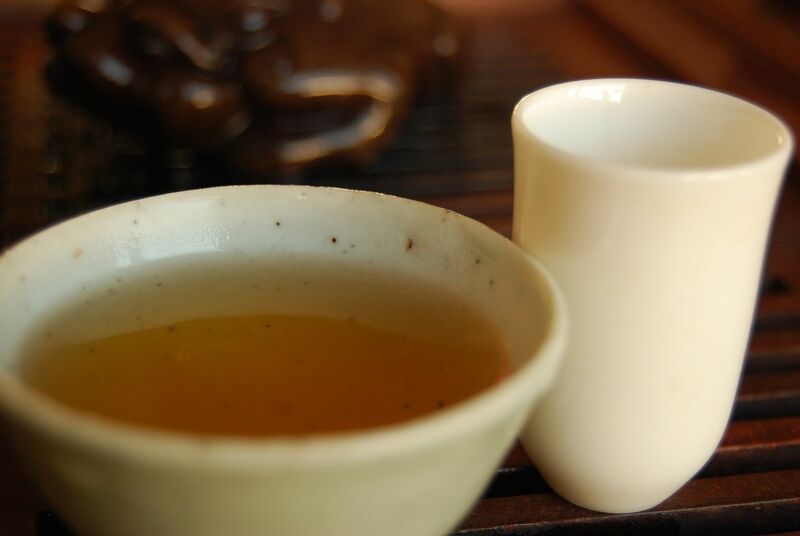 "It fills the mouth well and has a good effect in the throat that puts it above Mysteries X and Y; I particular enjoy its shengjin [mouth-watering effect]. It begins to numb the lips and the tip of the tongue, and has good overall duration." What an enjoyable experience that turned out to be, all the moreso once the real facts were revealed. I think that I would keep an eye on my storage humidity, were I Californian, but they were all great fun and very much appreciated. Coming soon: a head-to-head comparison of Hster's and my versions of the same immortal cake. There can be only one. 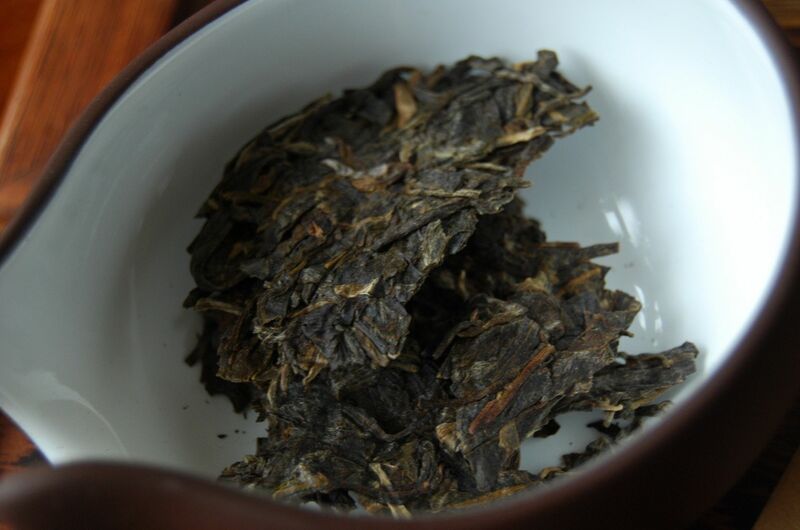 2007 Douji "Six Famous Tea Mountains", 2011 Douji "Yiwu"
At the time of writing, it is Chinese New Year. The Year of the Dragon has just passed, which was my "animal year". This dates me, because my age is therefore a multiple of twelve! Yes, I am 72. 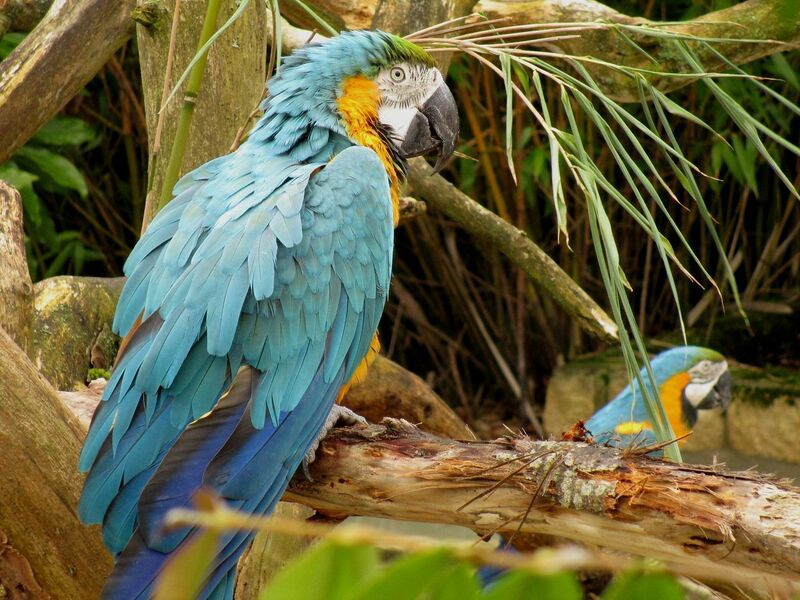 One's animal year is, it is said, a time of particular significance, in which one is particularly vulnerable. It is sometimes seen as a critical time, potentially for both good and ill. My dear wife even sewed a little scarlet ribbon on the inside of my belt, to act as a degree of protection. It is now, in the Year of the Snake, her own animal year, and she likewise wears a red-amber bangle, which was a personal possession of her own Laolao. Looking back on my animal year, it does indeed seem that it was a year of tremendous significance for the course of our family - a year in which much was decided, and which will probably be seen as the "turning point" in our family direction. I would not like to "count my chickens before they hatch", but events were put in motion that could very well lead to a (really very welcome) degree of certainty in our family situation. I look forward to the possibility of explaining more at some point in the future. Academic lives are filled with uncertainty, given the short-term nature of most non-tenured research contracts - perhaps this is true of everyone, but I see the definite personal effects of this in my own life. Lei and I are both in the same discipline, and in fact work for the same senior professor. You may have noticed, even over the course of the years on this humble web-site, how often I move from college to college within my university, often not staying in one place for more than a year or two, and this is due to the transient nature of academic posts for younger researchers. I am reminded of Kongzi / Confucius' words that a man must be established by the time he is thirty. I suspect that the great sage may not have been referring to the life of Western academics. Being established by the age of thirty would be considered an extraordinary feat, certainly in England. So, it is with something of a sigh of relief that I bring all of this to today's tea-session, in which we encounter a pair of Douji samples from the generous shelves of Jerry Ma, the owner of China Chadao. I casually browse my notes on the 2010 Douji Yiwu. It seems that I didn't enjoy it very much. As chance would have it, I appear to have closed the article by writing "My hopes will remain high for the 2011 Douji Yiwu." Here we are, some years later, sitting down with this particular tea. 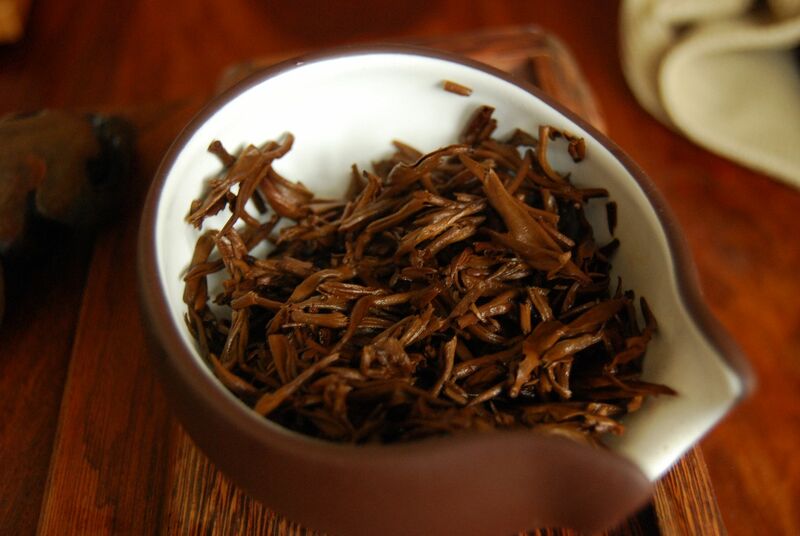 This is a tea which, as with most Douji cakes, looks very pleasant when dry. Although the leaves are fragmented, they are healthily shiny, and the hairs on each leaf are obvious. 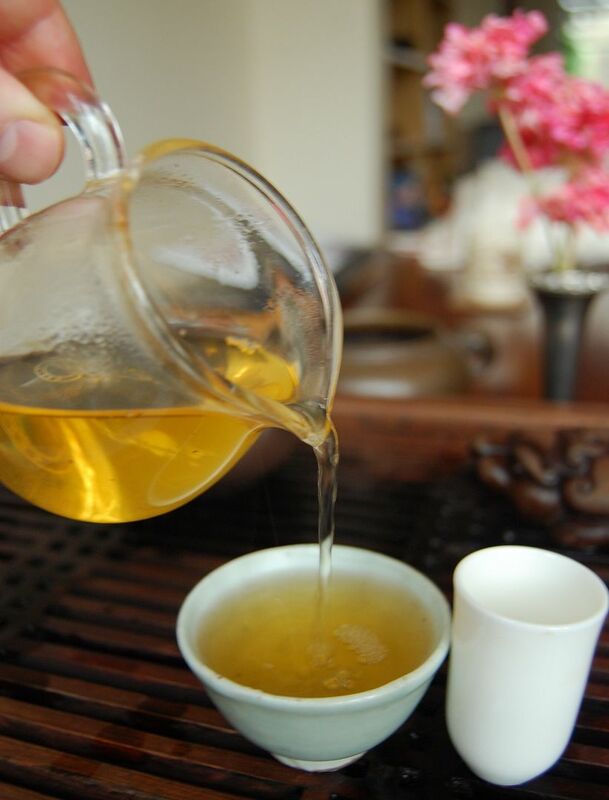 It is a tea that takes three or four infusions to reach the state pictured above; before that, it is a watery, nondescript pale yellow. Likewise in character, it takes some time to become full-bodied and sweet, as it eventually becomes. This is not at all bad. 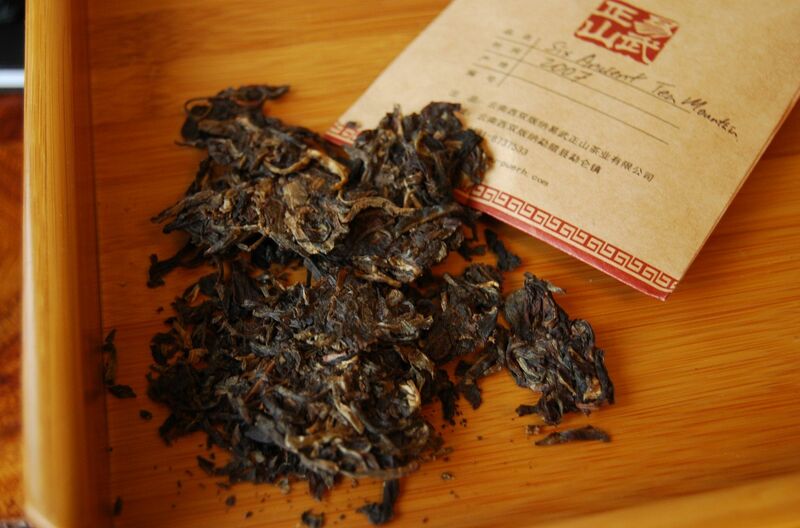 The genre of the tea is "wet straw" Yiwu, which is one of my favourites. For me, the epitome of this genre is my beloved, and humble, 2006 Xingshunxiang. The Douji variety is quite dense in its sweetness, after the fourth infusion, but it has the explicit addition of Douji "blackness" that dwells in its base, and becomes particularly obvious in the aftertaste. This must be a consequence of production because, as with modern Xiaguan cakes, Douji appear to be able to impart the characteristic to leaves from almost any area. 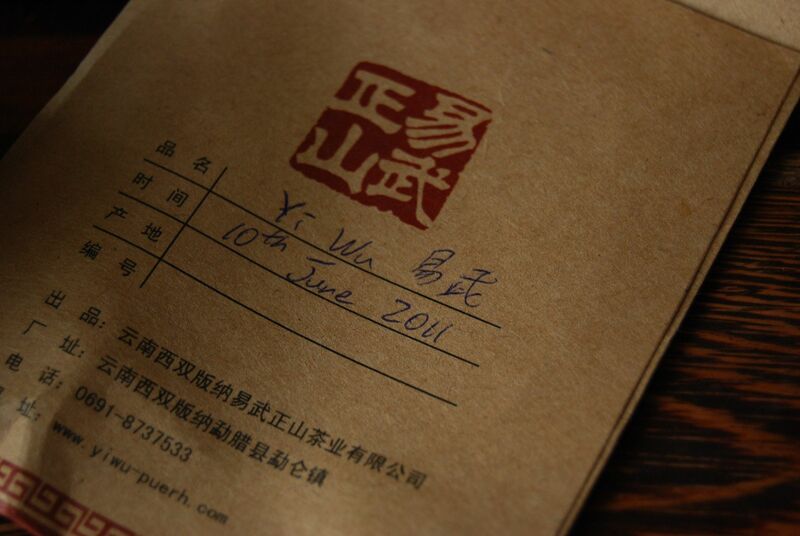 I don't know that it is particularly welcome in an Yiwu tea. 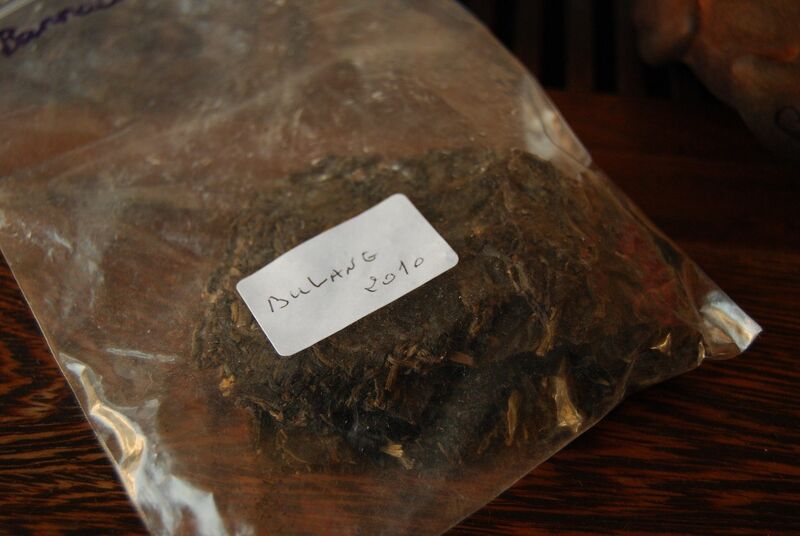 Ultimately, it is better than my memory of the citric 2010, but it is, in the end, an unexalted and straightforward Yiwu. While not for sale at China Chadao, I can imagine that the Douji-mandated price would be quite high, and the tea surely cannot live up to such a price. 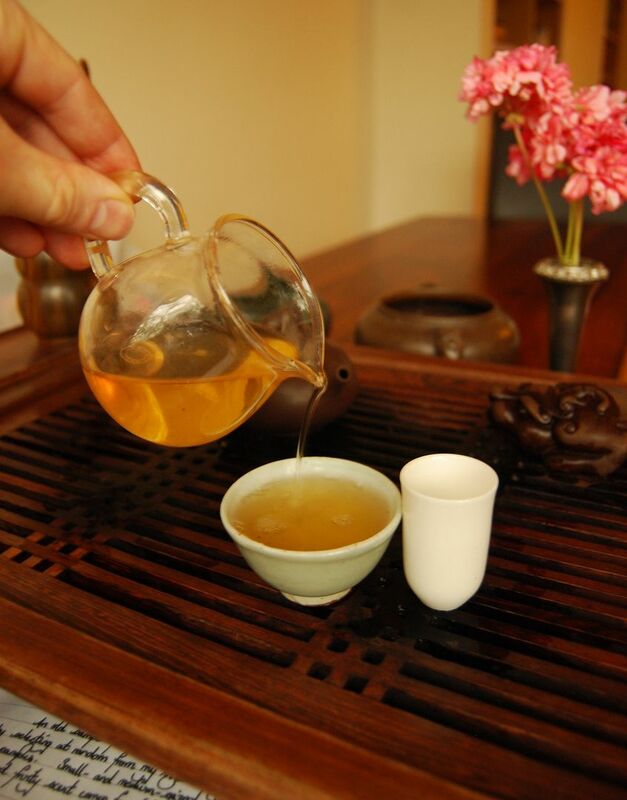 Given that Douji is a brand of the Yiwu Zhengshan Tea Company, I would imagine that they would have Yiwu cakes "down" by now, and that each year would be an improvement in quality. However, the 2010 and 2011 Yiwu cakes were certainly rather flat, to my tastes, and I am left wondering what has changed with Douji. This next tea is available - it comes as a xiaobing of 200g, and currently costs $80. 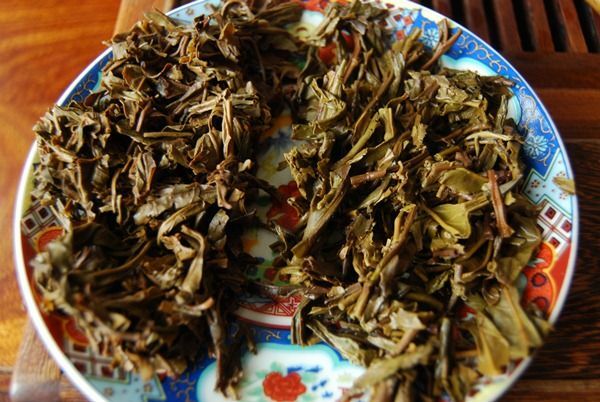 As with the Yiwu, the leaves are larger fragments but look healthy. Perhaps due to the cold winter climate, the tea is asleep, and has very little in the way of aroma. Regular readers may recall my appreciation for, among other things, an old-fashioned pu'ercha. 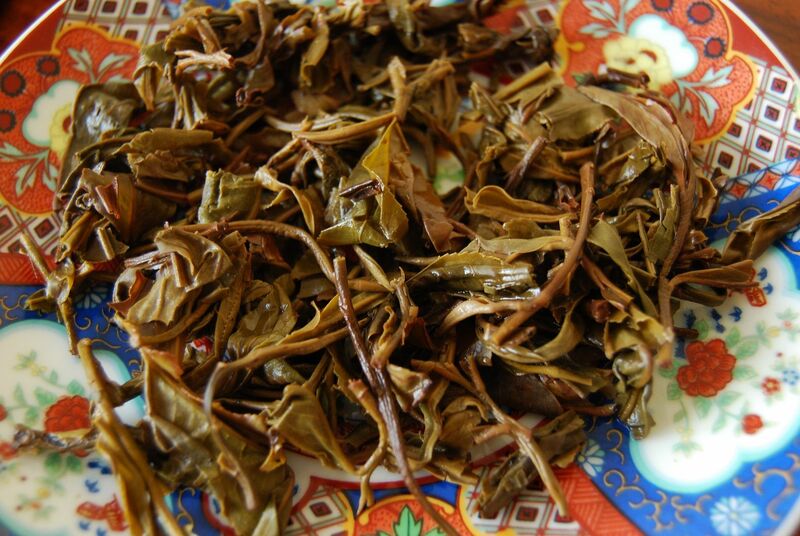 This blend of leaves from the "six famous tea mountains" in Xishuangbanna is definitely in that genre, and I feel right at home. While the blend is broad, and therefore does not taste of any particular mountain, it is decidedly "Banna". This is a point in its favour, and my mind recalls the series of 'Banna cakes from young to old that I have been fortunate enough to encounter. They have the potential to age very well, being the "original" pu'ercha. This is a (very) strong blend. It is also extremely straightforward: the character of cup 1, infusion 1 is precisely the same as all future cups. 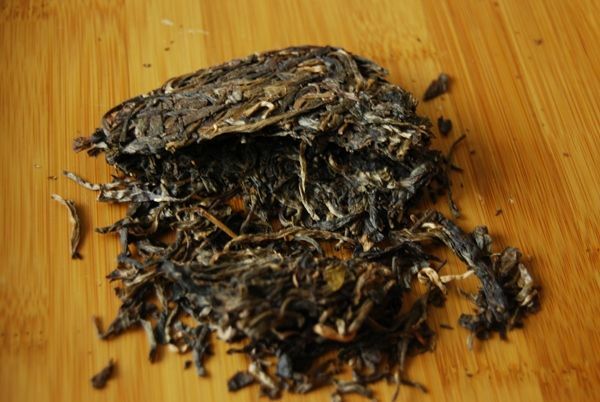 It does not suffer from the thin texture of the Yiwu, and has a more solid body. This combines with a fresh cooling sensation that leaves the breath minty after just two cups. It is ultra-orthodox, and, unusually for Douji, has little of the "house style" to it. It could well be that, if I lived in a hot and humid country, I would favour a strong, old-style cake like this for immediate storage. However, its price is really very high - $80 for a half-weight cake is a significant outlay for a cake that is so straightforward. 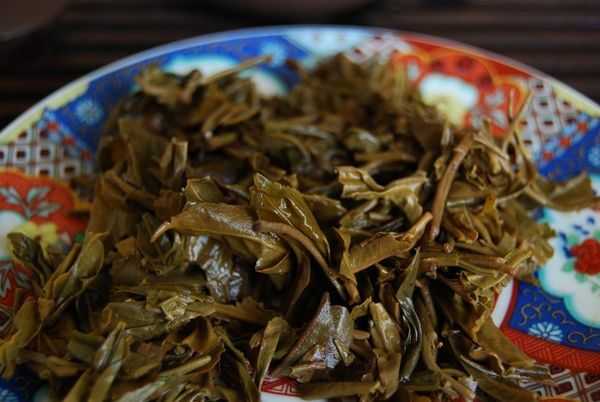 The quality of the leaves is very good, as evinced by the cooling sensation and their longevity, but... that price is something of an obstacle. A good tea, in itself, but the Douji-mandated price may be too high. 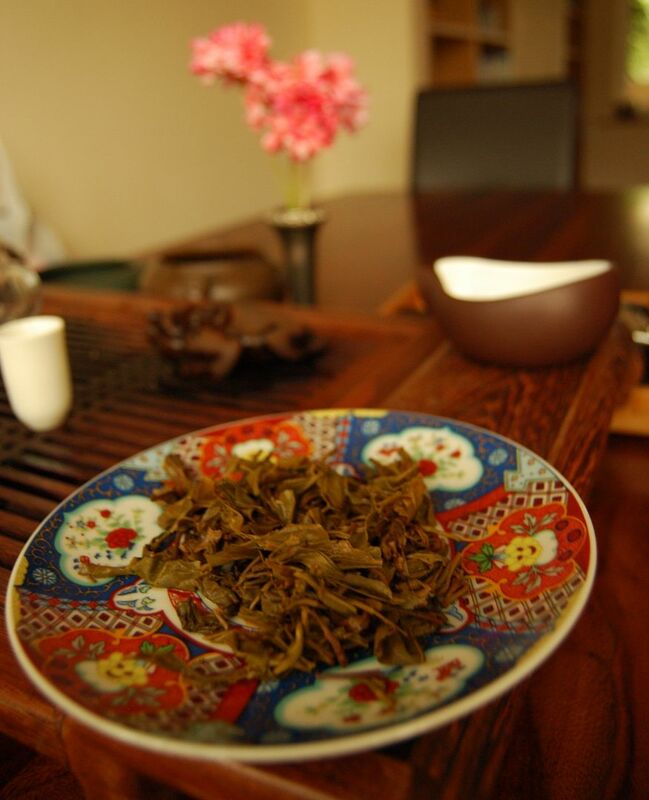 Shown together, with the 2007 cake on the left, and the 2011 Yiwu on the right, one can see the difference in ages from the colour of the leaves, and also the more heterogenous nature of the 2007's blend. I'm still waiting for Douji to retain the charming heights that they scaled with some of their 2006 cakes. One shouldn't give up hope. 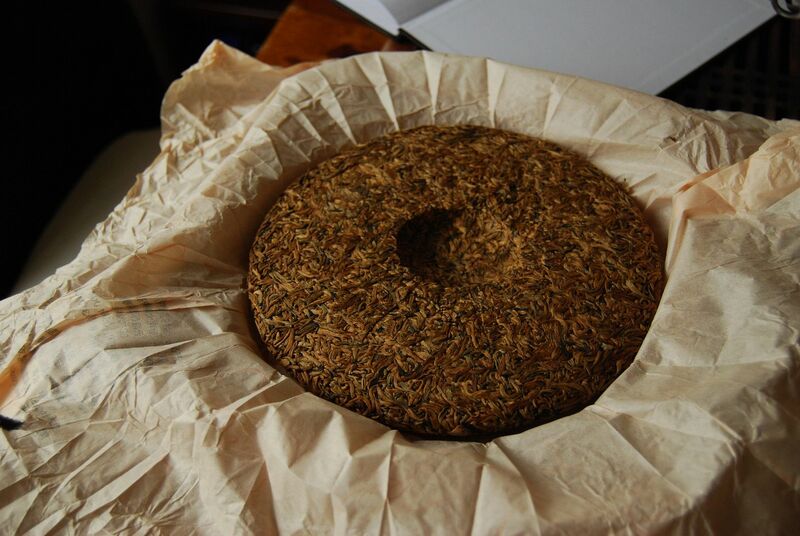 I fondly remember buying random cakes from Yunnan Sourcing, the inventory so large (and generally so good) that finding fun tea at a low price was quite easy. It is something that I haven't had the time to do for some years now, and the discovery of a random sample generously provided by Scott was the perfect opportunity to revisit my old habit. Just as in those experiments of earlier years, I have absolutely no idea what "Nanmuchun" cakes are like. This is all part of the fun. You never know which brand could turn out to be a new classic. The world of pu'ercha is surprisingly meritocratic, with the possibility of good cakes unrestricted to particular years, locations, or labels. Everyone, and every cake, has a shot at goal. Pictured above is the little bag that provided me with the excitement to drink it immediately; an undiscovered sample bag from Scott. Shown below, the leaves of this cake may be seen to be quite small; I have a recollection that Wuliangshan leaves are habitually this way. Randomly reading my article on the excellent 2011 Wuliangshan cake (which I entonginated), I am reminded of the potential for this area. Certainly, it is one that I rather enjoy. Tea from this remote, unpopular region is generally quite affordable, and this is great for pu'ercha drinkers who are willing to step off the beaten track. The scent of this cake's leaves is immediately enticing, with a potent sweetness. Happily, it brews an honest yellow, which turns orange in the air. 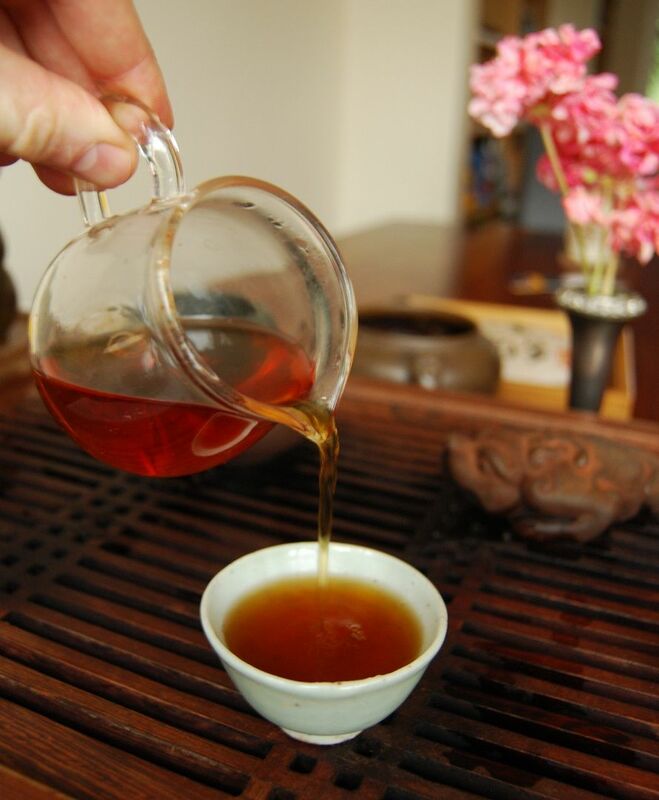 It has the buttery scent in the wenxiangbei [aroma cup] of fresh tea, although it has no lengxiang [cooling scent]. This sometimes suggests a lack of finishing characteristics, in the throat, and therefore a lack of huigan (to my mind). It has a decent kuwei, but there is not too much complexity in the throat, as the scent suggested. This is compensated by a good vibrancy on the tongue and some cooling notes on the breath. Ultimately, the body is somewhat thin and watery, and I have trouble getting it to be truly interesting without pushing the bitterness through the ceiling. That said, the cake is very cheap (something like $25), and it is certainly pleasant to drink. 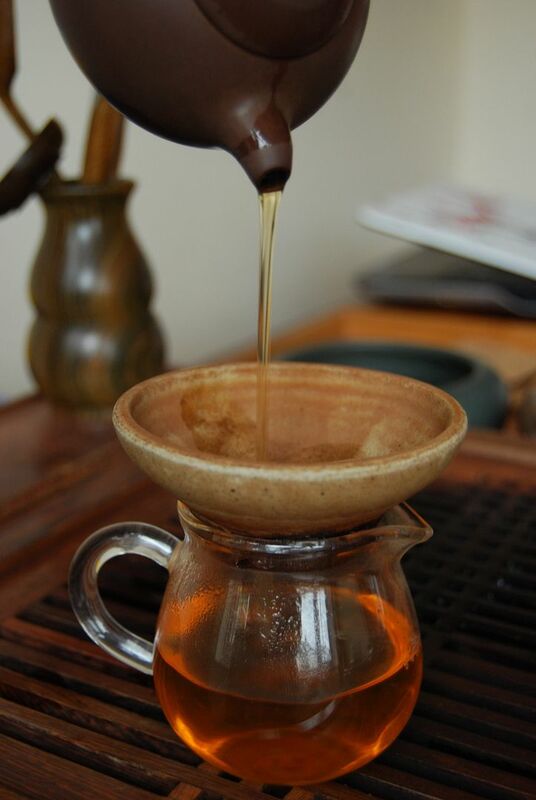 I subsequently took the remainder of the generous sample to my lab for future drinking and, each time that I unthinkingly brewed an infusion or two of it while concentrating elsewhere, I was immediately brought back to the cup by its sweetness and pleasant buttery tone. It is a good, lo-fi cake, but I suspect may not hold up to the rigours of the years, due to its thin body. Even in four years, however, it has picked up some notes of adolescence. A disposable and enjoyable little pu'ercha... but the 2011 Wuliangshan made by Scott was only $20, and there really is no comparison. Today's session is the result of a random selection, digging around in the nether-regions of my shelves, attempting to find something new to drink. I found two teas, nestled away in the depths, which turned out to be extremely complementary. Bannacha is one of those fantastic outfits that sells small quantities of very robust pu'ercha at exceptionally sociable prices. It reminds me of tea-vendors of old, where the inventories did not stretch on for 97 pages, and where the prices permitted the possibility of finding a real bargain. No matter what your relationship to shopping, everyone likes a bargain. 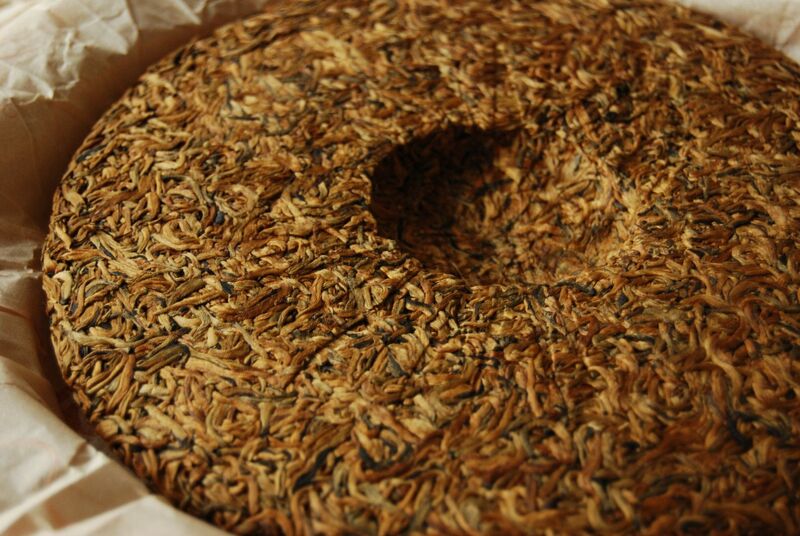 This Bulangshan cake does not appear anywhere on the web-site, and I wonder if it ever did. It is entirely possible that, due to its lack of markings, this is a personal production. The enigma appeals to me. 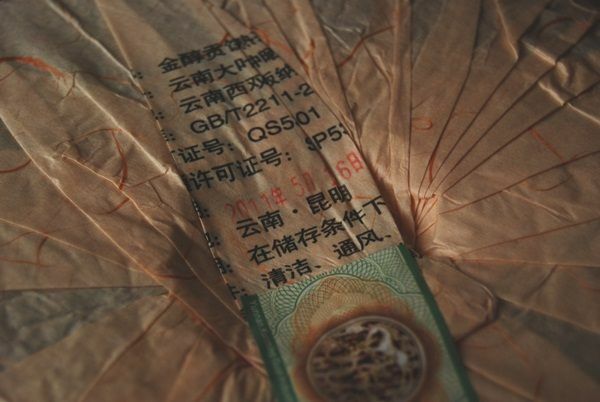 Edit: this "2010 Bulang" is the 2012 Guanzizai "Xiangrugu". William of Bannacha puts the bitterness down to the contribution from Laoman'e. As I settle down to enjoy a punch-up with that which, at first appearances, looks to be a rather pretty cake, I realise that I must blow a thin layer of dust from my teatray in order to get the session started. Surely this is an indication that something is amiss - when one's teatray has gathered dust. The hotplate beneath the tetsubin begins to exude the rather unsettling scent of cooking dust. Bulang. You know what to expect by now. The scent and flavour are both pleasantly sweet and yet, these first impressions remind us that we must steel ourselves for the finish. And there it is: a solid core of bitterness that is rather appealing. I must confess to being not one of those people who likes bitterness for the sake of it. Indeed, there are plenty of "bad" kuwei that might come about via pesticides and other unseemly additions. However, there is a certain strength and backbone that a tea would be less interesting without. It just so happens that many Bulang cakes have a great deal of it, and I appreciate the challenge. Rather like a meal with huajiao [flower pepper], a good cake with decent kuwei can be plenty of fun. This kuwei needs to be the variety that is associated with good leaves, and not the brassy green unpleasantness that derives from taidicha [plantation tea]. It is quite straightforward to tell the difference, though, after a few battles. This is a touch "soapy", a touch numbing, rather "tingling", and is deeply soothing. The huigan is substantial and rewarding. I wrote in my diary, "It is the taste of freedom." 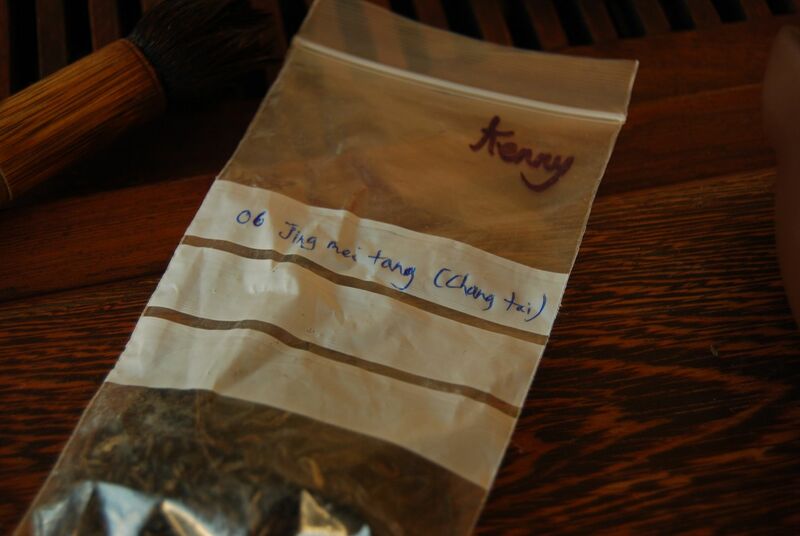 Kenny is a sterling dude that lives in Hong Kong, and has great taste in tea. Certainly, the samples that he has sent to me in the past have been entirely excellent. Therefore, it is with some degree of excitement that I found the sample bag pictured above, apparently untouched. 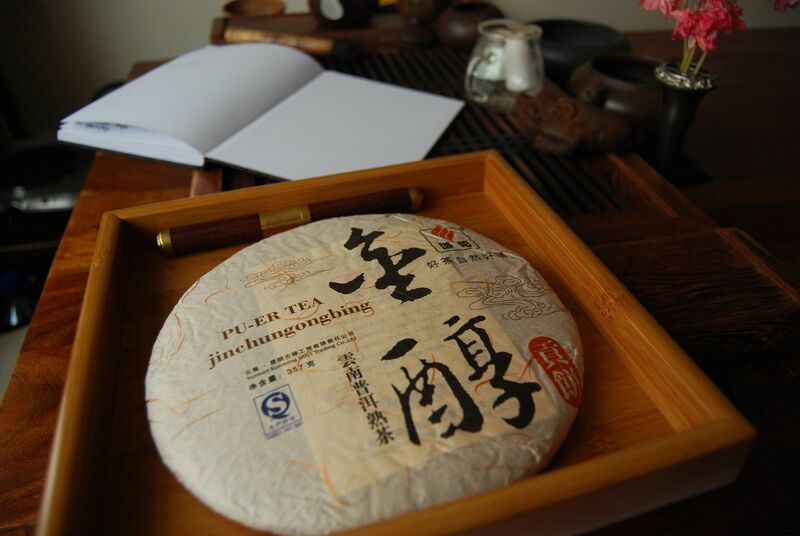 Jingmeitang is the brand produced by Huang Chuanfang, a Taiwanese teachap of some repute. Kenny notes that this was pressed by the ever-obliging Changtai; it seems that many of the private pressings that Kenny has sent to me over the years, from friends or otherwise, have come via the equipment of Changtai factory. The dark maocha comprises larger fragments of medium-sized leaves, which have a "traditional" feeling to them, far from the modern trend towards almost-untouched, entirely whole leaves. 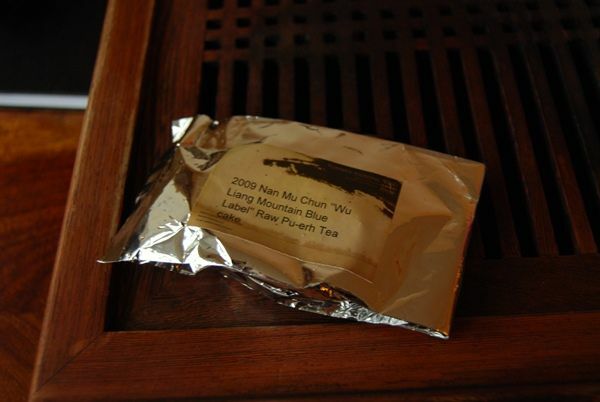 This tea is now seven years old, and, despite languishing in a plastic bag at chez moi, has acquired some older touches. Its soup is orange solidity, and it falls into that particular genre of tea (usually Yiwu) which I tend to call "wet straw". This is not a bad thing. 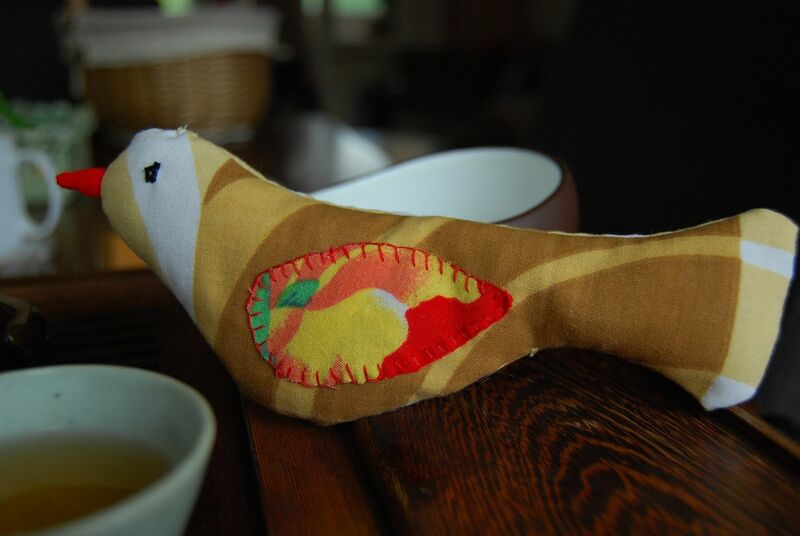 Likewise, it has an overtone of something that could only be described as "fish", and yet which is much more pleasant than you might otherwise suspect. 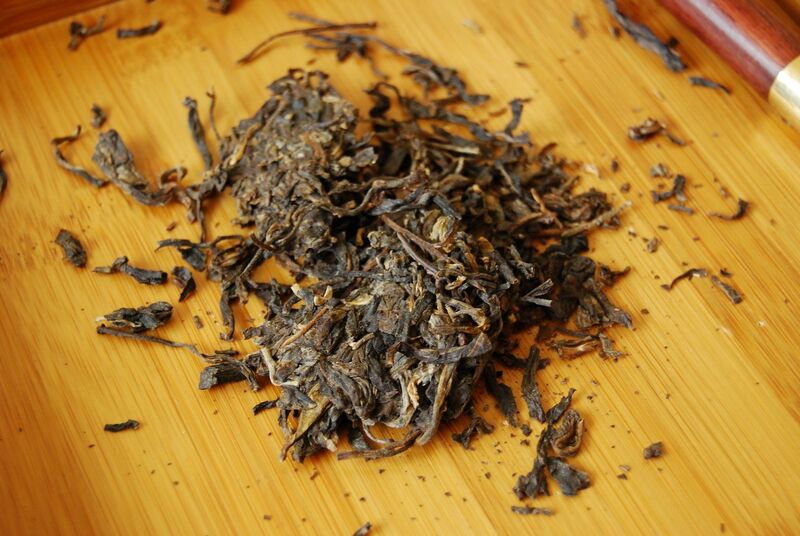 As it wakes from its dormancy, the Jingmeitang builds up a deep sweetness. The breath is cooled, the tongue lightly numbed. Everything is in accordance. 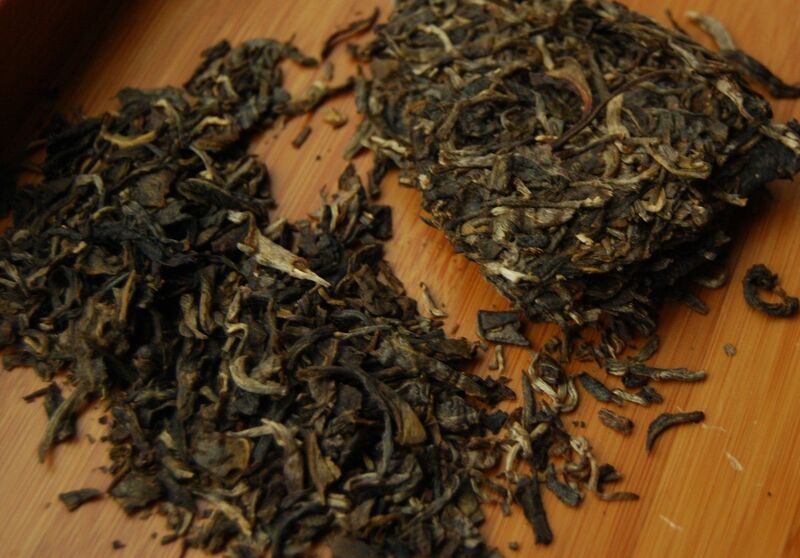 The density of its sweetness, rolling into a solid kuwei, makes it most enjoyable. Kudos indeed to Mr. Huang, and thanks to Bannacha and Kenny for, at some point in the past, sending me these delightful samples that worked so well together: the beast and the beauty, respectively, you might say. The leaves are of medium size, with a decent scent of mineral, humid sweetness. Orange in soup, and sharp-mineral in character, this is the epitome of hot-and-humid storage. Unlike some, it has a strong cooling sensation to accompany its rich, malty character. The dark-red cake reminds me of the differences in storage between England and the south-China region. The humid darkness of this latter genre is distinct from the not-wet, not-dry storage that our cakes appear to be experiencing here. In travelling, a companion. My recent travels have been both enjoyable and tiring, mostly being to do with struggling for academic tenure. This is the nature of travel. 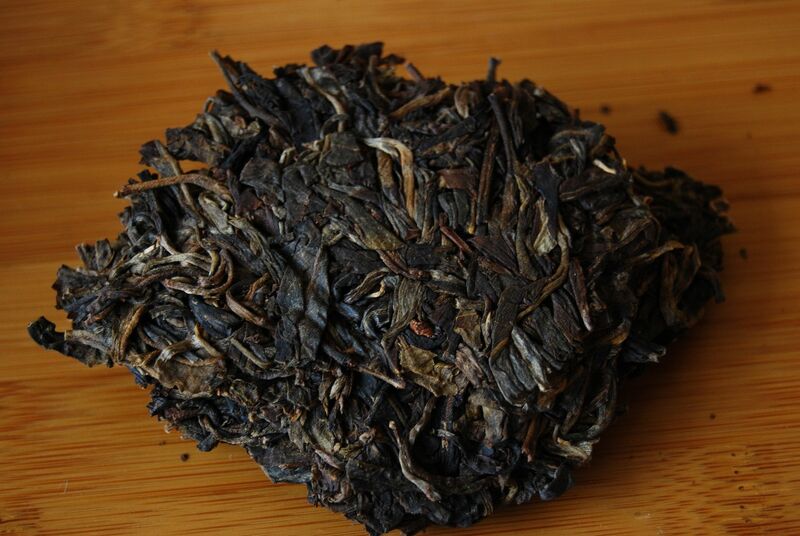 My companion, twofold: being my family, and, today, this particular tea. In life, compassion. It is the same spirit in both clauses, and is one of my favourite sentiments in Japanese. When the proverb says "compassion", they mean it in the same sense as did 達磨 Daruma (Bodhidharma). It is a special kind of compassion. The tea-table is becoming something of a rare event, but one that therefore holds an ever-increasing hold over my affections. 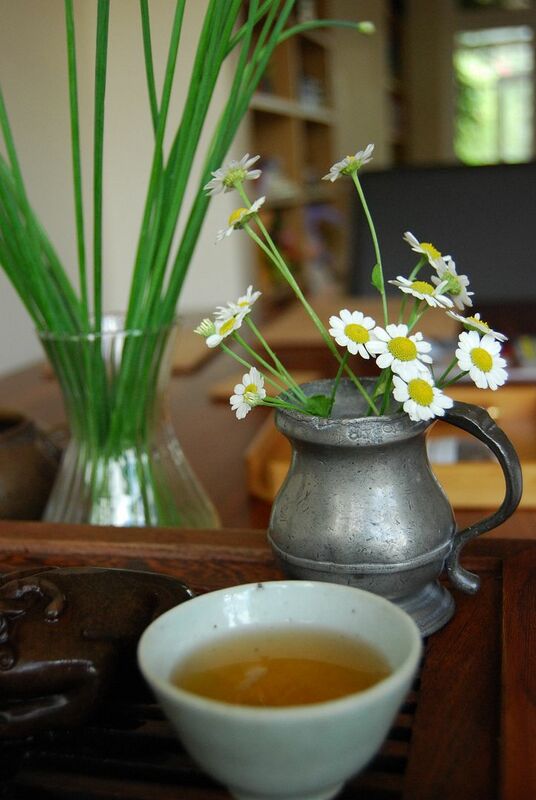 To sit at the tea-table is to travel, through going nowhere. In a humble life packed to the brim with tiny details, some trivial, some not-so-trivial, the tea-table represents both solace and travelling. It is not by accident that we end up with this particular companion for my travel today, because it is a cake most kindly provided by the fathomless generosity of dear Keng, from Singapore. 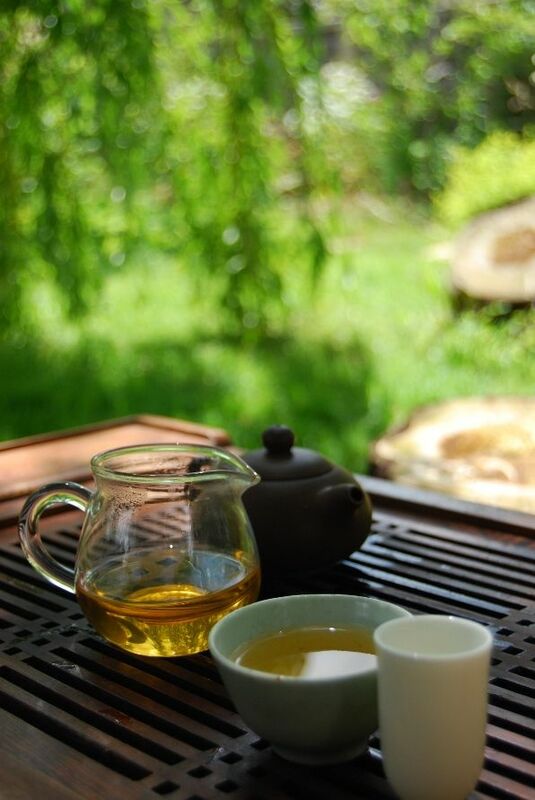 One day, I would very much like to go that country and spend an afternoon in a teashop with my friends there. As I sat in the common room of my college with another Singaporean friend, who was visiting last week, I realised that he was the only one of my Singaporean friends whom I had actually met. 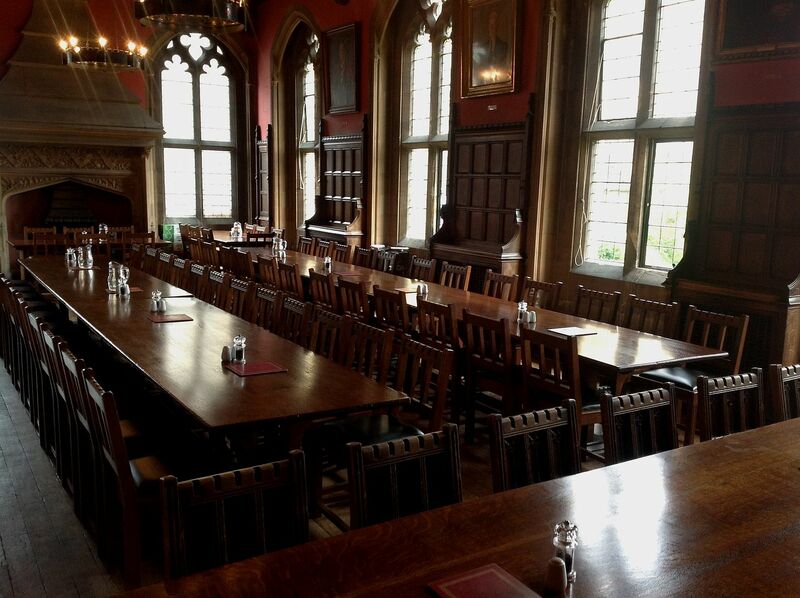 Actually, now I come to think of it, I did once have tea in the common room of my old college with the wife and daughter of another Singaporean tea-friend, who were passing through on the way to the daughter's nearby university town. We drank lapsang souchong, I recall. A good one. When the weather outside is simultaneously snowing and raining, and the house is cold, some degree of warmth and comfort is required. At the tea-table, I wrap myself in two heavy blankets, looking rather like an old man. 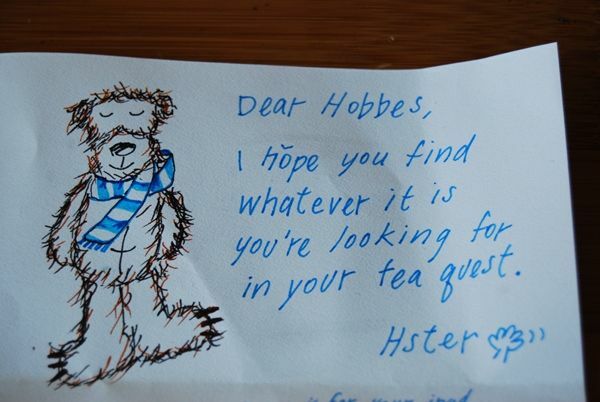 My cold hand extends from the folds of the blankets to manipulate the kettle and teapot. On such a day, my spirit demands the warmth of hongcha. This cake, pictured above and below, is made of pu'ercha tips, and yet has a character very similar to pu'ercha. 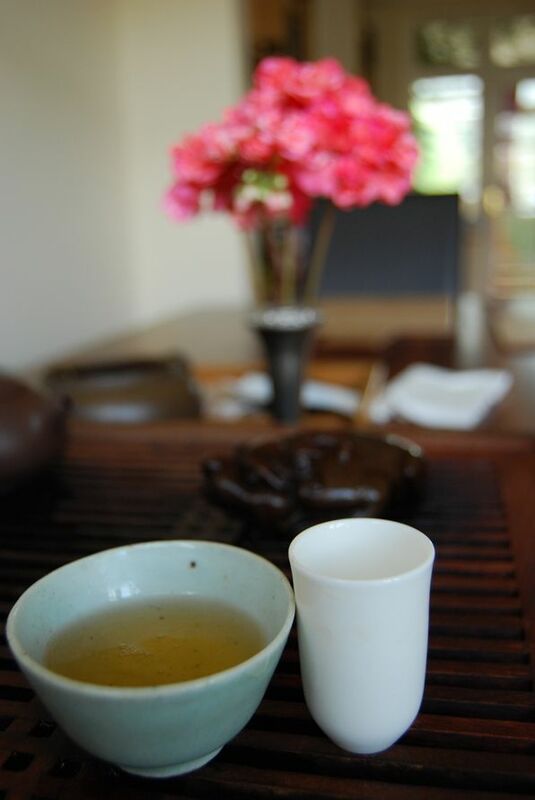 Such is the degree of similarity, in flavour, colour, and aroma, that I wonder if some hongcha methods have been used in its production. This is all in its favour, because the result is splendid indeed, and fits perfectly into the chill of the February morning. This is a tea that demands to be touched. It is flexible, and bends laterally. It becomes apparent that the pu'erdao, pictured below, is entirely unnecessary. Though the leaves have been compressed, there is little that holds them together, and they may be crumbled free of the bing using the fingers. Perhaps it is obvious to most people, but I have just recently, over the last year or so, come to appreciate the great significance of other people in one's life, and the dramatic effect that their support provides. In many ways, I have come to appreciate how entirely dependent my life is on the goodwill of others. During the on-going tenure process, this has become sharply focussed and completely obvious. It is, really, only by the good graces of others that I can be said to have attained anything of value. When I was a young undergraduate, I thought that it was solely one's own devices that were of importance. How long it takes to unlearn that lesson, and to learn the proper humility. Maybe this is all an integral part of the process. In life, compassion. Keng's unusual gift turns out to be Just What the Doctor Ordered. Its smooth, slick texture wins me over, while its tangy, somewhat bitter, finish lends it sufficient challenge to wake me, and retain my interest. 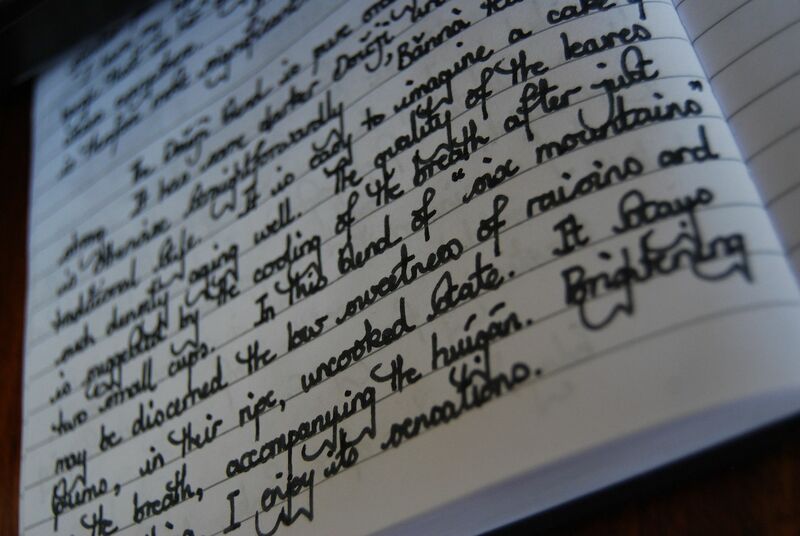 Page after page of my diary becomes filled with my odd little handwriting - odd for an engineer, anyway. A colleague came to me after looking through the piles of "anonymous" assessment reports of the students who have applied to study engineering with us next year. "I could tell your reports from your hand-writing." He looked conspiratorial. We will see what the eventual outcome of the current period of hard work and travelling comes to be. My journey today, at the tea-table, was a long one. My pen ran out of ink. The water jug ran empty. The tea, however, continued undaunted. Fittingly, its name is "Jinchan", meaning "Golden-mellow". The "Gongbing" part means "tribute [to the Emperor!] cake", which is a standard phrase, much like "Chawang". If there is a point to today's article, it might be that we must be mindful of the presence of companions and our implicit dependence upon them. 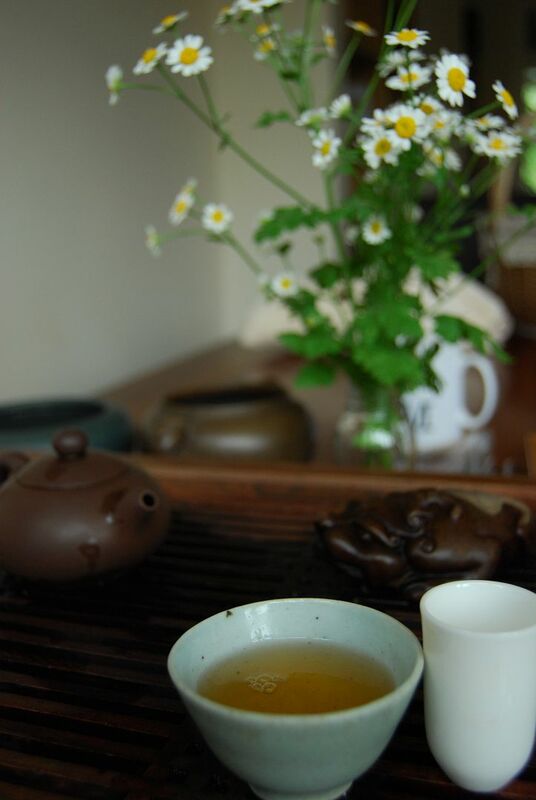 Particularly in the tiny world of tea, as in many other worlds, each personality seems to make a very great difference. A gift of compassionate generosity goes a long way, much further than one might otherwise think, and it is with a gratitude that I drink this wonderfully malty, rugged, yet smooth and tippy pu'ercha.